The government has denied press reports it is planning to ask everyone to switch from fresh to long-life milk as a means to reduce energy usage. The clarification from the Department for Environment, Food and Rural Affairs (Defra) follows the leaking of a report into the future of the dairy sector. Drawn up by civil servants, the paper highlights the fact that shops do not need to refrigerate long-life milk. 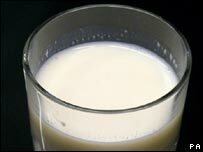 Defra said it would not be telling people what kind of milk to drink. "Defra has been working in close collaboration with all parts of the dairy supply chain to look at ways to reduce the environmental impact of dairy production and consumption, including greenhouse gas emissions," said a spokesman. "The paper referred to was drawn up to stimulate discussion - it does not represent government policy and was never intended to. "The government is not and will not be telling people what kind of milk to drink, people need to make their own decisions." The National Farmers' Union (NFU) said any suggestion that people should switch to long-life or UHT (ultra heat treatment) milk was "ridiculous". NFU dairy chairman Gwyn Jones added that it was also "grossly insensitive" at a time when the industry was recovering from outbreaks of both foot-and-mouth and bluetongue. "If it wasn't so foolhardy, it would be dangerous," Mr Jones told the BBC. "We give the consumer what he or she wants [which is fresh milk], he said. "If we forgo the UK's long-held tradition of fresh milk, it would be a sure way to wreck the market." While consumption of UHT milk in the UK is just 8.4%, it is much more popular on the continent. In countries such as France, it accounts for 95% of all milk sales.